888Sport are a less well known online bookmaker who are making a splash with their new customer offer and wide range of odds and markets. » Free bets every weekend. New customers only – Minimum deposit of £10 using deposit code 30f – A qualifying bet is a ‘real money’ stake of at least £10 (£20 e/w) placed on any sports markets – Minimum odds of 1/2 (1.5) – Free bets credited upon qualifying bet settlement and expire after 7 days – Free bet stakes not included in returns – Deposit method and withdrawal restrictions apply. New customers to 888Sport receive £30 in bonuses when they bet just £10 with the company as a welcome promotion. This bonus is paid in the form of £30 in free sports bets (you get 2x £10 regular and 1x £10 which must be used on mobile). The qualifying bet must be placed individually on the customer’s bet slip, within 90 days of registration and must be on a single selection or ‘straight line’ multiple in order to be eligible for the enhanced odds. It MUST also be a minimum of £10 in value and placed at odds of 1.50 (2/1) or bigger odds to qualify. Any free bets earned are stake not returned when used. More Info: full details of the offer on our 888Sport bonus page. ‘American Dream’ Acca Refund – Customers can get their stake back as a free bet up to a maximum of £25 if a five plus selection accumulator on the NBA, NHL or NFL misses out because of just one leg. ‘Free Bet Saturdays’ – A weekly promotions run by 888Sport, ‘free bet Saturdays’ offer customers a free bet worth £5 if they place a £10 single pre-match bet and a £10 single in-play bet on the same Premier League game. The free bet must be place on an in-play market the next day. ‘Beaten by the Rag’ Refund – Another ongoing refund offer provided by 888Sport, this ‘Beaten by the Rag’ promotion provides customers with their stake back as a free bet up to a maximum of £25 if their selection in any UK horse race finishes second to a 20/1 shot or longer. To see the latest promotions visit 888Sport and select ‘Promotions’. Live Betting – 888Sport’s ‘Live Betting’ section of their website provides in-play markets for a huge variety of sports, all around the world and on a daily basis. It even includes an in-depth calendar showing the events where in-play markets will be offer during the next seven days. Live Betting Stats and Extras – When you view the in-play markets for any event, you will also be able to see a live scoreboard and other basic stats for the match or event in question. What’s more, there is also a separate in-depth results and scores centre and a statistics service for every sport under the sun. Bet & Watch – A feature offered for all Great Britain and Ireland horse races, Bet & Watch allows punters to watch any flat or national hunt race that is held, as long as they have bet at least £1 or 50p each way on the race. A variety of other sports streams are also occasionally available to any customer with a funded account or who has placed a bet in the past 24 hours. As is now routinely the case with all of the top online bookmakers, 888Sport do provide their services by way of a mobile app to allow customers to bet on the move via a variety of different devices. That range of devices on which the 888Sport service is available in fact, couldn’t be more comprehensive, as all operating systems and device types are well catered for. There are iOS and Android 888Sport apps which are downloadable through a variety of channels, including QR codes and text links on the main desktop 888Sport site, and their mobile site is accessible via any device’s web browser too. Once a customer has accessed the 888Sport mobile app, they will find it to be both attractive and user-friendly, with a number of handy features to speed up navigation and a really intuitive and simple to use bet slip. Another big tick in the yes column of our review of 888Sport. The ‘888’ brand has been present in online gaming and gambling since 1997 and covers an array of subsidiary companies, including 888 Poker, 888 Bingo and of course 888Sport which was first launched in 2008. As a comparatively young bookmaker therefore, 888Sport have had to work hard to garner popularity and custom from the longer established sites but in the most part have succeeded in doing so, as you’ll tell from the positive nature of our 888Sport review so far. Operating out of Gibraltar, the bookmaker now has a very large customer base which is mostly focussed in the UK and is viewed by many as now being amongst the big boys when it comes to online sports betting. As a top provider of online sports betting, 888Sport routinely deal with millions of transactions and as such have top class security measures in place. These include the use of what they describe as ‘sophisticated RSA public/private key encryption technology’ to ensure the security of any financial details dealt with by the site by the way of financial transactions. Furthermore, 888 Sport store all customer and financial details on a secure server protected by a number of advanced firewalls to further guard against any potential breaches. The company too, look to promote responsible gambling and to that end provide wide-ranging self-limiting and self-exclusion services so that any customer can put a cap on how much they bet or remove themselves from temptation entirely. Throughout the 888 Sport website customers will find ‘Contact Us’ links, which take them to a page where they can fill out an online form to seek assistance and support on any issue. Replies to that form submission come by way of an email. If you wish to speak to someone directly, you can also find a ‘Member Support’ telephone number for your country via the 888 Sport website, which can be contacted between 09.00 – 22.00 GMT. 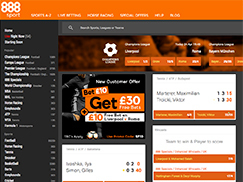 Despite being a relative newcomer to the online bookmaking market having only been established in 2008, 888Sport provides a really good all-around service to customers which makes it a top choice for anyone from the casual punter to the dedicated gambler. Both the desktop version of the site and the mobile app are pleasing to the eye and really simple to navigate, and make finding and placing a bet on a chosen market simple and swift. The fact that the mobile app is easily accessible via all kinds of device is also another big plus. The provision of live scores and statistics, great in-play betting and a good variety of live streaming – especially of horse racing – is yet another positive, and when you add the interesting variety of ongoing promotions to the mix you get a really impressive package. The welcome bonus is also a highlight with just a £10 bet needed to trigger £30 in bonuses (any 300% bonus is always impressive). As we’ve mentioned above, the 888Sport service is a well-rounded and impressive one but there is one main area where it could yet be improved to place it right at the head of the market when it comes to online bookmakers. The range of live streaming options offered by 888Sport outside of horse racing is also limited when compared to some competitors, but it is difficult to criticize this too much all they while that there are other providers who do not provide the service at all. Owner/s: 888 Holdings ltd. A company owned by Avi and Aaron Shaked. Want to discuss anything in our 888Sport review? Then get in contact with us via this page.